Jennifer Osburn has worked at the Ohio Chamber of Commerce for two years after previously serving as the Director of Community Action Practice at GBQ Partners where she spent time auditing mostly non-profits. She’s been able to bring that prior experience over to the Ohio Chamber with her in her role as Director of Finance & Administration. She graduated with a Bachelors of Science in Business Administration from Bowling Green State University and then went on to earn a Masters Degree in Accounting from The Ohio State University. 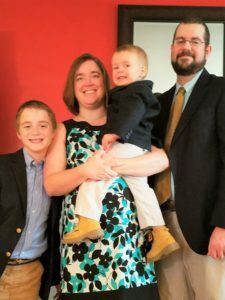 Jen currently lives with her husband Keith and two sons, Hunter and Jacob. Get to know Jennifer Osburn in the fifth installment of our Employee Spotlight. Do you have any pets? My husband and I have had three Labrador Retrievers over the past 15 years, two of which were rescues. We are looking forward to getting a puppy soon now that our 2 year-old is potty-trained! Where did you grow up? I was born in Columbus and we moved down to Lebanon, Ohio when I was 7, which was where I lived until college. Favorite part of your current job? The variety of my job – I handle the finances for the Chamber and several other entities, work with the IT consultants, ensure HR compliance, worked on the implementation team for our CRM database, and deal with building issues, among other day-to-day tasks. What do you do when you are not working? My oldest son is involved in soccer and Scouts. My husband and I were very involved with Cub Scouts during the past five years with him – leading his den, planning the calendar and den meetings, running the popcorn sale and serving on the leadership committee. That took up most of our free time but was very fulfilling. If you could have dinner with two people, living or dead, who would they be? Both of my grandmothers – I didn’t get to spend enough time with them as an adult before they passed. They were both very strong women in their own unique ways and I would love to just chat with them! Career Highlight? I have two – one would be passing the CPA Exam early in my career, back when it was paper and pencil and you had to study for all four sections at the same time. The second would be being named to Columbus Business First’s Forty under 40 in 2013. It was such an honor and a very humbling experience to be recognized with so many great leaders in our community. Tell us one thing that most people don’t know about you. I earned the Girl Scout Gold Award when I was in high school, which is the equivalent to the Boy Scout Eagle Award, requiring a lot of work over many years and then culminating in a service project where I worked with a domestic violence women’s shelter.